NORTHERN Ireland’s hygiene and infection regulator has never inspected any of Northern Ireland’s neonatal units. The Regulation & Quality Improvement Authority (RQIA) conducts an ongoing programme of infection prevention/hygiene inspection across Northern Ireland based on the Regional Healthcare Hygiene and Cleanliness Standards, published by DHSSPS in July 2011. In a previous story we revealed that the neonatal unit at the Royal Victoria Hospital, which had been the source of a pseudomonas outbreak that killed three babies, had never undergone a hygiene inspection by the regulator. Since then it has emerged that water sample results for the Southern Trust and the Western Trust show that Pseudomonas has been detected in a small number of water outlets in the neonatal units at Daisy Hill, Craigavon and the Erne hospital. Sink taps were also identified as the source of a different strain of the infection which affected three babies at Altnagelvin Hospital in Derry before Christmas. One of those infants died. Along with the Royal Jubilee and Altnagelvin, RQIA has never inspected any of the other three neonatal units located across Northern Ireland’s acute hospitals. The Detail can also reveal new details of a previous pseudomonas case from November 2011 that can be traced to the Royal Victoria’s Children’s ward, a short distance away from the main hospital site. Four year-old Katie Maguire, was admitted to Royal Victoria’s Children’s ward in November 2011. Her father Gary McCann contacted The Detail after our story revealed a lack of inspection at wards from the external regulator. His daughter has cerebral palsy and intractable epilepsy, a condition which means she can need up to 25 medications by syringe a day. After being admitted to hospital after taking a seizure, Katie initially spent some time the Paediatric Intensive Care Unit (PICU) and subsequently was moved onto the PAUL ward. It was while on this ward that Mr McCann was told by staff that his daughter had contracted pseudomonas, he says. “I can remember being told about Katie contracting pseudomonas and being very concerned and conscious of the environment we were in. The PAUL ward is for very, very sick children, they let us walk about freely without saying, you need to wear a mask or take extra precaution. “Obviously when you spend as much time in hospitals as we do when you have a sick child, you make friends and get to know other parents and we were sitting down having coffee with other parents who had children in the intensive care unit. Meanwhile having contact with our child who had this highly contagious bacterial infection." RQIA conducted infection prevention/hygiene inspections at the Royal Belfast Hospital for Sick Children (RBHSC) in August 2009 and again in July 2010. During the initial visit only four areas of the children’s hospital were inspected. The Allen Ward, the Barbour Ward, A&E and outpatients. 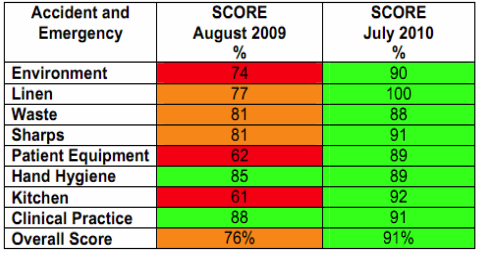 In August 2009 A&E and the Allen Ward were scored as partially compliant (76%) and minimally compliant (70%) respectively. 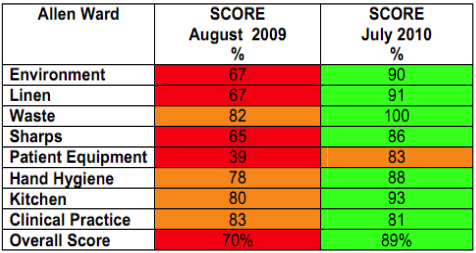 A subsequent inspection in July 2010 to the same areas indicated both areas compliant (A&E 91% and Allen Ward 89%). RQIA did not inspect the RBHSC during 2011. The unannounced hygiene inspection by RQIA on the 6th August 2009 was designed to takes a snapshot of hygiene and infection control standards within specified functional areas of the Children’s Hospital. RQIA inspectors stress in their report that the findings on the day of the visit should not be taken as a representation of standards in the hospital over a period of time. The inspectors noted that while there had been no inappropriate items in the clinical room of Barbour ward, the walls were damaged, the hand washing sink was old, stained and worn and dust was observed on top of the medicine fridge and the base of the drugs trolley. The drains in both hand washing sinks in the clinical room and treatment room were also observed to be dirty. The taps had a build up of lime scale. The purpose of this unannounced inspection was to re-audit two areas previously inspected by the RQIA in August 2009. It had previously identified 69 risk factors where improvement was required. The July 2010 noted that 55 factors had been addressed and 14 had been stated for the second time. While the wards had shown a marked improvement, the inspectors also noted that even though the Accident and Emergency department had maintained and improved on their compliance score, six risk factors were identified on the previous inspection and two remained outstanding. These related to the taps in the dirty utility room not being elbow operated or automated and the lack of hot water at the sink in the relatives room. They also highlighted the fact that the drains in both hand washing sinks in the clinical room and treatment room were dirty and that the taps had a build up of lime scale. The Children’s hospital has not been re-inspected by the RQIA since. We contacted the RQIA for clarification on what this would involve, they said the terms of reference for the review and membership of review team are currently being finalised, and they would be issuing a statement in due course.